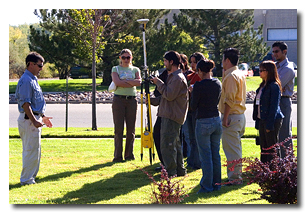 UNAVCO's Research Experience in Solid Earth Science for Students (RESESS) program launched in the summer of 2005 with intern Stephen Hernández. Stephen conducted research with mentor Dr. Kristine Larson of the University of Colorado and staff at UNAVCO on multipath sources at the Parkfield GPS array. Specular multipath remains one of the most limiting error sources compromising position estimates collected from 1-Hertz Global Positioning System (GPS) data. In 2004, after 38 years, the long-awaited Parkfield, California, earthquake was finally captured. Data from Parkfield promises to provide deeper insight into earthquake physics and post-seismic crustal deformation, of which 1-Hz data is particularly well-suited. For GPS to provide sub-centimeter accuracy to geo-scientists, though, confusing multipath error from a broad range of frequencies must first be mitigated. Characterizing multipath at these sites entailed identifying trends from problem sites, satellites, and any other factors contributing to relavant range (position) error. 1-Hz GPS data that included signal-to-noise ratios (SNR) were used to make characterization possible. This included the analysis of power spectra and spectrograms to single out receivers recording uncharacteristically large amplitudes and/or long period interference indicative of specular multipath. In addition, via the use of a forward model, varying frequencies were correlated with a respective estimated distance of antenna from reflector. Preliminary results have identified specific satellites and receivers with significant multipath. Distances of reflectors from antenna, coupled with actual photos of different site monuments, may then aid in predicting when and where significant multipath will reappear. Knowledge gained from multipath characterization can be applied toward the eventual facilitation of multipath at other sites with the Parkfield array as a representative model. Hernández, S., Larson, K. M., 2005. 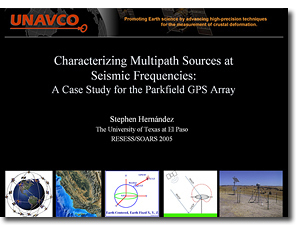 Characterizing Multipath Sources at Seismic Frequencies: A Case Study for the Parkfield GPS Array, SACNAS National Conference Abstracts, v 1, 184 C32-SAT. Stephen (left) with fellow SOARS protégé and peer mentor, Erick Adame (right). UNAVCO's ten-week summer internship program, RESESS (Research Experience in Solid Earth Science for Students), began this year under Dr. Susan Eriksson, Director of Education and Outreach. RESESS intern, Stephen Hernández, came to UNAVCO from the University of Texas, El Paso,after completing his sophomore year in math and physics. Stephen worked with research mentor, Dr. Kristine Larson at the University of Colorado in Boulder, and with UNAVCO staff. His research project focused on the study of errors inherent to GPS measurements of continental plate motions. Specifically, he worked to identify and characterize multipath sources at the Parkfield GPS array. Stephen presented his results at the 2005 SACNAS (Society for Advancement of Chicanos and Native Americans in Science) Conference in Denver, Colorado this September. One of many team building exercises this summer. 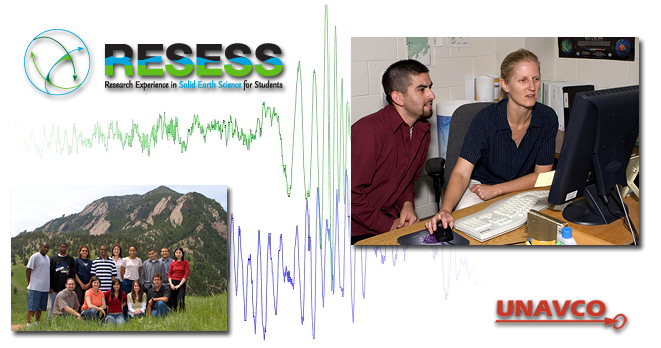 In its fledgling years, RESESS operates in partnership with the well-established SOARS (Significant Opportunities in Atmospheric Research and Science) internship program at UCAR. Stephen and his fellow protégés participated in SOARS-sponsored leadership orientation, team-building exercises, seminars, and writing workshops. These students form a core learning community from which they draw upon for peer support and shared experiences. RESESS aims to strengthen the presence of underrepresented groups within the solid earth sciences and increase the completion of master's and PhD degrees by these groups in the field. UNAVCO co-sponsored a SACNAS student tour of several local science facilities and research institutions prior to the national SACNAS conference. 55 students from Puerto Rico and across the US visited UNAVCO. There is more information on RESESS internships here. Explore other student employment opportunities at UNAVCO here.